Becoming a lifeboat crew member is one of the most rewarding volunteer jobs in the UK but rescuing lives at seas demands a rare fearlessness and steely selfless commitment. 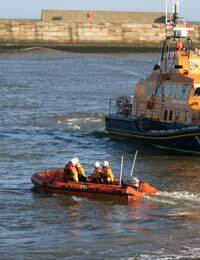 The RNLI is a charity rescue service set up to save lives at sea around the coasts of Great Britain and Ireland. Under the motto ‘train one, save many’ its 24 hour, 365 day service has now been operating since 1824 and currently boasts over 230 lifeboat stations. The demand for the RNLI’s services has not let up during its lifespan and is in fact in greater need now than ever, with lifeboat rescues having doubled since 1980, and 2006 being the rescue organisation’s busiest year on record. The RNLI now rescue an average 22 people every day of the year. The need for volunteers is therefore stronger than ever. Originally many of the lifeboat crews came from nautical backgrounds, but the decline of many maritime industries has meant the volunteer crews are largely comprised of normal working people such as teachers, plumbers or taxi drivers. Needless to say incidents at sea are more likely to occur in wild stormy weather in the middle of the night than on a sunny Sunday afternoon and so RNLI crew volunteers should be prepared to face the worst. Being hauled out of bed before dawn on a freezing cold January morning to attend to a fishing trawler struggling under 10 metre waves and gale force winds is an all too real situation for any RNLI crew member. Being part of a lifeboat crew is a big commitment that could ultimately include risking ones life, and should not be taken lightly. The commitment of volunteers is not only measured by the free hours lent to sea rescue but the constant updating of equipment and vessels means essential training programmes also regularly soak up free time. Volunteers may also be asked to help with showing visitors around the station as well as with local fundraising. RNLI lifeboat crew members carry a lot of responsibilities on their shoulders and so need to be up to the job, otherwise they put their own lives in peril as well as those they are rescuing. Firstly crew members need to be over 18 years old - or over 17 with parents’ permission - and under 45 for the inshore lifeboats, and under 55 for the all weather lifeboats. They should also either live or work near a lifeboat station. Given the active nature of the role, crew members need to be physically fit and unafraid of honest hard physical work. They also need to be healthy in mind and body too, and duly demonstrate with a medical and eyesight test. Not surprisingly being a member of the crew, particularly one responsible for the lives of others, demands good team playing characteristics, such as obeying orders, communicating well, getting on well with other people. In return for precious time and tireless commitment, the RNLI offers one of the most exciting, challenging and rewarding voluntary jobs in the UK. The world class rescue service provides first class training and equipment, guidance and support.